First of all, I'm celebrating my one-year anniversary in Blogland this week! I'm hosting a fun giveaway. Actually, I've accepted a generous offer from Stan Williams, The Elegant Thrifter. He's providing your gift: a copy of his book, The Find: The Housing Works Book of Decorating With Thrift Shop Treasures, Flea Market Objects, and Vintage Details. To enter, leave a comment on Stan's June 16th post, HERE. Let him know you stopped by, OK? Come back and leave a quick comment for me on this post, making sure I have an e-mail address I can use to reach you when you win Stan's wonderful book! That's it -- a comment for Stan and one for me and you're IN the competition! The winner's autographed and personalized copy of The Find will be shipped directly from Stan.You have through the end of the day on June 25th to enter. You don't even have to follow Affordable Accoutrements, subscribe, or have a blog of your own --- not that I don't want you to follow -- I appreciate all the great people who've visited and been so supportive of my efforts! Now on to something many of us celebrate every week of the year -- Tablescape Thursday with Susan of Between Naps on the Porch! As many of you who stop by regularly know, I like to make Affordable Accoutrements a moveable feast ... or at least I like to use a variety of locations where one MIGHT actually have a feast. Today we're in the sitting room just as the sun's rising. The table's set for four. I removed the coffee table and brought in a glass-topped table from the deck (it needed cleaning anyway). The armchairs live in this room, and I brought in two side chairs from the dining room. I challenged myself to create a mix-and-match table setting, including pieces I might not ordinarily use together. Some of the items are available in my brand new Etsy shop (click the Etsy logo in the sidebar!). I'll be adding additional listings as time allows (in rare moments when I can force myself to part with beautiful vintage tabletop items!). This room faces east, so if I wanted to take advantage of the natural lighting, it needed to happen early in the day. I love the elegance of a table where everything is in perfect harmony. I also, however, enjoy eclectic table settings such as this one. They're several degrees less formal and infinitely more challenging and unique. The flowers are, once again, from the garden -- a few of these and a handful of those, casually arranged. There are, among others, gooseneck loosestrife (more about those HERE), cone flowers, Autumn sedum, lacecap hydrangeas, blooms from a butterfly bush, and plumes from purple fountain grass. There are four each of champagne/tall sherbets, iced tea/water glasses, and wine glasses -- all from antiques shops/malls. The painting of a mother and child was a gift from the artist, my friend, Kate. The medium is gouache, an opaque version of watercolor. She saw the subjects of her painting in a crowd and was fascinated by their hats and by the universal pose of a young mother balancing a child on her hip. There's quite a bit of blue on this table -- patterns of the dinner plates and cups & saucers, the napkins, the compote holding flowers, and the band of color on the creamer & sugar bowl. None of the above match in terms of hue, value, or intensity. Is that wrong? I suppose it's up to the individual to decide. The tall sherbets are Candlewick by Imperial. Dinner plates, eggplant-colored glass bread & butter plates/underplates, and the glass chargers are all thrifted. The charger plates were new-in-the-box, made in China for Costco. They're labeled "gold," but appear to me to be more of a bronze shade. The cups & saucers are "Royale" by Colclough China. They're English bone china, and the backstamp indicates that they're from the 1960s. From a local estate sale, they're currently available in my Etsy shop. Do you think you might enjoy sipping your morning coffee or afternoon tea from one of these? In reality, I set this table the previous afternoon. I took evening shots, refrigerated the flowers for the night, returned them the next morning, and took photographs of the room bathed in the early light of day. I always enjoy seeing the effect of backlighting on crystal stemware! The downside is that it reveals any specks of dust or water spots from less-than-meticulous hand drying. The iced tea glasses are Wavecrest by Fostoria (1935-43). The loop optic design creates the effect of cascading water. It's similar to Cambridge Caprice, and I occasionally mix the two patterns on the same table. In the background you'll see a few pieces of Fostoria American (1915-82) displayed. Somewhere (wrapped and boxed) I have a set of American Lady claret glasses (1934-71). The base and stem are faceted in a cubist pattern like American, but the bowls of the glasses are smooth, hand-blown glass. When I find them, I'll set an American table for you! The vintage tablecloth is from a local estate sale. A solid white cloth beneath it provides "underclothing" and conceals the true nature of the table. I did the magnolia painting years ago, and an instructor I studied with did the small abstract on the right. The oak secretary holds my Fostoria "Holly" collection (1942-1980). OK, it holds PART of the Holly collection. It's probably my favorite stemware. The clock on the mantel was a gift to my father when I was a child (although it's older than I am by a few decades). The abstract oil painting over the sofa was created with a palette knife by a friend. I saw it in a show and told him how much I liked it, saying "someone could decorate a room around it." When the show ended, he left it at the gallery as a gift for me with a note instructing me to "start decorating." The American Indian on the left was a painting I did using soft pastels (call the medium "colored chalk" if you want pastelists to bristle with indignation!). This is turning into as much a gallery tour as tablescape post, isn't it? As I said, the flatware is mis-matched. Some of it I used in last week's Tablescape Thursday post. The salad forks and the knives have bakelite handles. I brought the floor lamp up from downstairs to provide additional lighting for this post. The farm scene above the secretary is one I did in a watercolor workshop. I liked aspects of the painting, but didn't like the way the bottom half looked, so I chopped it off and made it a narrow horizontal. I forgot to mention that I used hosta blooms in the arrangement. This is a very sweet-smelling centerpiece, mostly thanks to the butterfly bush. A few hosta varieties are fragrant; most are not. The silverplated coffee pot is from a local estate sale. It's one of my favorite pieces. Time to (you already know!) light the candles! The three-light candleholders on the mantel are Caprice by Cambridge (1936-58). The mantel itself was recycled from an old home by the builder of this house. The mirror shows it's age in various places, but I think that adds to the charm. The photographer usually holds the copyright to the photo and, unless they've expressly given permission for its use, making a painting based on a photo would infringe the photographer's copyright. In terms of US copyright law: "Only the owner of copyright in a work has the right to prepare, or to authorize someone else to create, a new version of that work." You may be able to obtain permission to use a photo for a derivative work from the photographer, or if you're using a photo library buy the right to use it. Just thought you'd want to know ... it's obvious that the "borrowing" of photographs online is an issue these days. I've noticed that many bloggers now "watermark" their photos and make a point of asking visitors to the site not to use their images without written permission. It pays to ask rather than assume, doesn't it? Vintage utensils on a plate. I especially like the little monogrammed butter/cheese knife. The view from the dining room. I'll have to remember this seating option the next time there are too many guests at dinner to fit comfortably around the dining table. Another (shameless) commercial announcement. The set of four etched wine glasses was listed in the Etsy shop today. I bought them at a local antique mall. I didn't (and don't) know the maker or the pattern, but I found them appealing. I just haven't remembered to use them, so I thought I'd give you a chance to give them a new home. Closer view of the Candlewick stem. I've noticed that several TT participants have similar glasses (only with cobalt blue stems) from Dollar Tree! Susan and Marty come to mind. It's just as well that I didn't see them at DT when they were available. The last thing I need is more glassware ... unless I find some I really, really like! Time to light all the candles! Hi Bill, charming table setting!! The setting is very atmospheric with all the candles alight.I love the paintings of the girl alone and the one of the lady and child. Jackie in UK. great post and congrats on your anniversary! Well I visited Stan and left him a comment. His book sounds great and I would love to win it! Either way, I'll buy it because I think I would really enjoy it. Now, on to your fantastic tablescape! You always blow me away! I love it all and how it manages to all work together. Elegant all the way. Oh my word that table is just stunning. The tablecloth is just beautiful and I really like the way you put so many different things together. It certainly catches your attention and just makes me want to look for hours!!! To be able to even wash those items would be a treat!! Hi Dear Bill! Congratulations on your one year bloggaversary! I remember when Susan told us to come and visit you the first time! I was smitten with your lovely tablescaping talents! Now we see you're a talented artist too! Love seeing your paintings and the little girl one is just beautiful! Love your room and the way you've set the table. It's great to see different areas of your beautiful home. I have a mantle clock almost just like yours. I think it's about a 1930. Had it worked on recently. I just love these clocks. What lovely pieces you have - I love the piece where you have your Fostoria seated! It's a beautiful room! I know I don't just speak for myself - I'm so glad you came to Blogland. My favorite kind of table, mix/match, they are so much more interesting instead of everything matching perfectly...I love informality. The floral arrangement is beautiful in that blue compote...you can put something together out of nothing and make it beautiful...that is a compliment, Bill! Your art work is very impressive. Happy 1st year Blog-O-versary, Bill!!! It certainly seems like you've been doing this much longer. You have such a sweet, humble way of *speaking* in your posts. I feel like I'm right there, listening to you as we walk around the table. Wish that I could join you in a delicious meal in the beautiful setting. What gorgeous colors you've mixed for this TT & you have such delightful spaces in which to play. I don't ever remember seeing this room. Keep using up that gooseneck stuff...I think it looks lovely in your arrangement in that beautiful blue compote. I love the "cascading water" effect on the Fostoria glassware. Your wonderful art collection around the room just adds so much to the overall atmosphere of elegance & sophistication. Your mantel (or mantle...both spellings are correct) clock looks like a Howard Miller design that my DD has inherited from her husband's side of the family. Your posts are always so educational as well as entertaining. I never come away without having learned something! I really love how the table looks so different from morning light to candlelight! It's lovely! The mix of dishes has an informal feel, yet it's still very sophisticated. Great job as always! Happy Anniversary, Bill! I cannot believe it is only a year!! Now, when are you going to write that book?? Beautiful Table Bill. Love the mix and match of it all. The whole room is lovely and I'm glad you showed us and told us about the paintings and other accessories. Your home is so interesting and lovely. I have got to grow some flowers for a cutting garden. Happy One Year Blog Anniversary! Every picture is gorgeous. You continue to create something different and beautiful. The blue compote is stunning and pulls everything together with that pop of color. Love your flower arrangement. Everything is very lovely. Congratulations Bill for the first year! This a very pretty and elegant setting! Hi Bill! Happy Blogoversary! I went and visited (and became a follower of) The Elegant Thrifter- can't wait to go back there! As usual, your table and pictures are gorgeous! Love the watercolor too! Have a good week! Hope to see you in my neck of blogland! Happy 1-year-blog-anniversary. 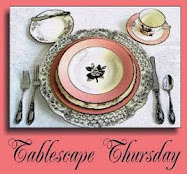 Hard to believe that you blog only 1 year and join Tablescape-Thursday. Everything in your tablescapes is just perfect. I love that flower arrangement for its pastel colors and the way that the gooseneck loosestrife and purple fountain grass plumes look like feathers. Or like the shooting star lights of little fire crackers. Your table show how nice mix and match things can look. It is a cozy atmosphere in that room anyway. The paintings are all gorgeous, you are an artist in painting as well as in collecting and combining things. I can't get ready with looking at the photos, always I dicover another nice detail. This is an amazing post! I love your artwork, you are quite the talented artist! And your a table artist as well! Beautiful vintage tablecloth, lovely mix of patterns and the vintage teapot is amazing! Oh, and your floral arrangements are always stunning! You could be a floral designer too! Happy first anniversary! I always enjoy your detailed descriptions of your tablescapes, as well as the varied settings you choose for the tables. I envy you your wonderful garden with such a variety of flowering plants! This table is a wonderful mix of pretty china and glassware -- so elegant! Bill, this is lovely! The colors, the mixes... all. And I love the fact that you do have these movable feasts. What a great vista this affords from the DR for your overflow guests or for a smaller dining group. You do some of the prettiest flower arrangements I've ever seen. They look effortless in their unstructured state, but I know it must take hours to make them so perfectly natural. I adore them ALL! I went shopping with a friend today in Fernandina, and I thought about you every time I saw vintage crystal or china and what you could have done with the pieces I saw. This 'scape is the perfect example of exactly what you would do, and it resonates beautifully with all of your fans. As always I love the candlelight shots and the ones with reflections as well as your commentary. I look forward to it each week. Hope you are enjoying your summer and staying cooler than we are here. While I already wished you a Happy Anniversary, please allow me to do so again. I also enjoyed visiting your friend. What a pretty mixture on your table. Love the flowers and what a beautiful coffee pot! Your home is so pretty and all your artwork is amazing! What a wonderfully talented man you are. Thanks for sharing so much with us. Bill, you are on one year, and I am on one month! Congrats! I love you r home! It is so beautiful, and you have set a lovely table. Curious about your draperies, they are so pretty! I just might copy them...would love to see more of your home. Happy Anniversary - I do so look forward to your tablescapes each week. Your gardens must be amazing, your arrangements are always so perfect. Your table is so elegant and, I mean this as a compliment, southern. I look at your photos and think Southern Elegance. The room is perfect in every light and your pictures are amazing. Thank you so much for sharing. Bill, Your dining room is so pretty! I love how your crystal is always so shimmering and sparkling! What a lovely assortment of accoutrements! You put them all together beautifully! Have a great weekend, Bill! Bill, When I come to visit one of your divine tablescapes I feel like I need to dress for dinner! Your scapes always have such a sense of elegance, and friendly formaltiy! Tonight I am taken with the way the flatware is arranged! So interesting. And the mix of color and patterns are always rich and detailed and so interesting! I could pick your tables anywhere! Beautiful and perfect. Well, Bill, you did it again! Just when I think you have put together the most interesting table, you pull off something like this! Fantastic! I always think my tablescapes must have everything in coordinating shades. Your mix and match blues are just wonderful. Very interesting assortment! As always, your flower arrangement is simply elegant! I loved viewing your artwork. You are a talented man! Gorgeous table! I love mismatched, eclectic tables and yours brings it to a new level of GORGEOUS!! Happy Blogaversary! I'll visit Stan and leave a comment, his book looks interesting. You've been busy while I was away, starting an Etsy, etc! Fun post! Very well done, I really like all the different hues of blue. I also enjoyed seeing more of your paintings, and some of your beautiful home. It is so nice to visit your blog! You always have a such an interesting post, lovely table, beautiful flowers, and today an extra treat of your artwork! I am very interested in your antique oak desk that houses your favorite stemware. I have my great grandmother's desk/cabinet that was not left in good shape. In fact it is missing pieces. I will look to your desk as inspiration for when I tackle the job of rebuilding mine. Happy Anniversary! Flowers, china, silver, crystal and now beautiful art! Love it. ps. I just found some gorgeous Harmony House silverplate flatware!!! Off to get some polish. Oh, how I enjoyed this post! I felt like you were taking me on a personal tour of your lovely table and artwork. Your attention to detail is amazing and so appreciated by my eye. I love glassware in the early morning light. Congratulations on your anniversary! I have fallen under your spell! It's delightful, inspiring, artistic, tasteful and you've accomplished that which is hard to do - meld the old and the older into an appealing work of art! Lovely. You have such a wonderful knack with arranging and sharing the tables. The blues in all shades blend perfectly. Sometimes all one shade cause them to blend together. Thank you for sharing. Hi Bill! Thanks for stopping by today. So glad I could come over here and see your beautiful tablescape! And your floral centerpiece has inspired me to do something similar with an antique compote dish I just inherited. I just love when us bloggers are so inspiring! THis is one of my favorites of yours. Love the tablecloth, the flowers, the china... What time is dinner? Your tablescape is beautiful! I loved all your art and the stories behind them. Thank you for sharing your home! Your watercolor is amazing, Bill. Wonderful work. Thanks for the tour of the 'gallery'. You are such a talented artist - both on canvas and tablescape. Your handmade floral arrangements are gorgeous; and you impress me each time with their scientific names and info although I don't know much about flowers, but I admire their beauty. You set a beautiful eclectic, elegant tablescape, with its blues, whites and crystal, ooh and that gorgeous compote. Fabulous teacup and saucer - I sure would enjoy a cup of Earl Grey in that teacup. Happy anniversary! Has it been a year already? That means I've known you for a year now. I guess that makes us old friends. My 5 year old daughter was sitting on my lap as I read your post, and in her words, "Oh, this is nice! Why don't we have one of those fire things?" She meant your fireplace. We just have an antique wood stove which we never use in Southern California. As always, you set a stunning table, but I have to say I truly enjoyed seeing and hearing the stories behind your artwork. I nearly had a second major in art history, but that would have meant another year at the university. Nevertheless, I have a soft spot in my heart for art (and dishes too). It's always a pleasure being a virtual guest at your dinner parties! Beautiful tablescape. Thank you for the chance to receive this great decorating book. finding all the estate sales you write about. Estate sales are few around where I live. Where in TN? I'm in Clarksville (NW of Nashville). I'm jealous of all of your blooms--we're wilting and fading already. Great table and consequent solution for an overflow of guests. I bet the cutwork tablecloth would look nice with glass peaking through for a less formal look, too. Congratulations on your one-year anniversary. Your table is very lovely. The tablecloth really is elegant. My favorite thing is that morning light coming in your windows. I love playing with light. I just got a new camera and I plan on doing a lot more of it! I love your painting!! It is very good. That is the easiest way for me to draw too, by using a photograph. But, I agree with you it would be just for me to keep. You consistently set an exquisite table, whether it is coordinating pieces or mismatched. Always bringing attention to the details and the surrounding setting. A joy to visit. 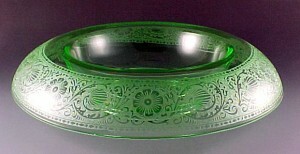 There is a Depression Glass Show in Cobb County - north of Atlanta next month. It is a feast for the Depression Glass admirer. Thank you for your kind remarks on my romantic pink tablescape. Blown away once again Bill. Beautifully done and beautifully photographed. Your artist's eye is evident everywhere. Thanks for the heads up on the giveaway. I went over and visited. Count me in for the giveaway, I posted in Stan's blog and came back here to comment. First I want to say the picture you painted of the little person with the hat, is beautiful! Your tablescape is gorgeous and stunning in candle light! I have one of the three candle Caprice candleholders in the center of my mantle, I have always loved it. I have (two) friends that have sets in the light blue, they're truly gorgeous! Your tablescape is perfect, as always! I loved the tour of the art as well, it's wonderful to have art in your home that has a story and is personal to you. The candle-lit pics are gorgeous. Overall such a lovely post. I'd love to win the book BTW, and am dropping by Stan's right after I say good bye here! Thanks for dropping by, hope you find some nice green stemware!! Have a great weekend. Congrats on your 1st anniversary in blogland. I love your blog, your ideas, and your style(s). I have visited your blogs many times. 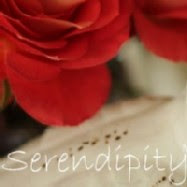 Thanks so much for following my blog and for your positive comment. I must have done something right. If not, you wouldn't follow my blog. I have been a follower of your blog since November last year. On your "Follow with Google Friend Connect" widget, my blog--"The Caffeinated Globe" is located between "Sweet Designs" and "Carol." Sorry for the typo in the last sentence in the first paragraph. "Your blog", not "your blogs." Oh my Bill....this is breathtaking! I just kept scrolling up and down the page. You are a master at decorating a table. Congrats on your year anniversary. Thank you so much for stopping by and leaving such a nice comment. Your tables are always so elegant, they intimidate me. hehehehehe So I really appreciated you stopping by. What eye candy is shown here for an incredible visual treat. I, too, am a glass nut so your pretties are especially appealing. How could one every have too many glasses? I did get over to visit and post on Stan's blog yesterday but just now got a chance to come back here. Not sure if that counts or not. *lol* Ah well, looking at all these lovely things are reward enough! Wow, one year!!! I have made it two months now. I am loving it, my family is loving to tease me about it. Glad you liked the boots for Girl's Camp especially the signature one of me in the boots. My husband got back the today too from backpacking with our boys (thought he'd be gone while I was). He showed me self portrait photo of his feet in fishing wader booties in a boat. He said he wanted to copy me. I told him I'd have to blog his feet too. Have a wonderful Sunday. Looks like this could be a very elegant Sunday dinner setting. Love how you do the evening light too. I will have to give that a go. Again, Happy Anniversary. Keep it up. Congratulations! I loved the flower arrangement..I know that is a gift and one I do not have...the compote is beautiful and I love the dark blue and white china. So beautifully done! I love each and every piece! I adore that you shopped the house and created this lovely table setting! I have the same mantel as you! Mine was white last summer, it got a make over to return to its original wood color. I looked so close at the mantel, and we have the same clock sitting on the mantel! I just wish I had all the dishes, stemware, and silver you have! I love the teapot!!!! The cups! Just in time for dinner with Tea! Lovely! Happy Blogaversary Bill! This table is fabulous! You have an amazing talent for putting it all together beautifully!! What a setting to announce this special occasion. Beautiful. I have quite a bit of catching up to do. I'm off to see what else I missed.